Business Banking Graduate, National Australia Bank, Melbourne. Bachelor of Journalism / Bachelor of Business, majoring in International Business. 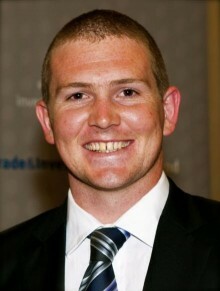 Graduated 2010.
International Trade Cadet, Queensland Government, Abu Dhabi. My first graduate position was as an International Trade Cadet with the Queensland Government where I worked in Abu Dhabi for six months helping businesses work in the Gulf and broader Middle East. I worked closely with the booming clean energy sector. Then, after taking time off to travel after this position, I sought a new job in the private sector and now work in corporate agribusiness for National Australia Bank in Melbourne. While I’ve never held a paid position in journalism, I’ve never regretted what I studied and still use plenty of the skills we were taught to research, enquire, write and present.